IKEA's Christmas tree offer is back! When you purchase a natural fir tree for $20, you'll receive a coupon for $20 off an IKEA purchase of $75 or more. Applicable only to fresh natural fir trees. Coupon can be redeemed on purchase of $75 or more between January 2-February 28, 2017. Offer is valid while tree supplies last. 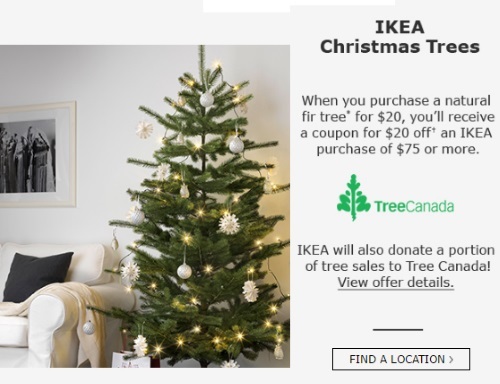 IKEA will also donate a portion of tree sales to Tree Canada.